having the power of seeing objects or actions beyond the range of natural vision. There’s a theme that happens organically in everyone of Sylvie’s Intensives. These themes are brought about naturally by the golden age legends themselves. 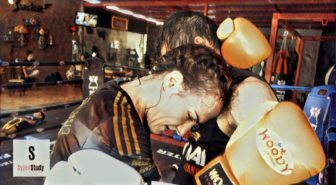 Each man has there own style and interpretation of what Muay Thai means to them and how to go about practicing and fighting with the art. In watching the whole of the session vlog, one can easily see the theme the legend has. With Karuhat, it’s almost immediately apparent that he is a mind reader. 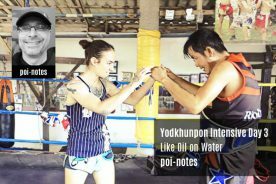 For a contrast, read my notes on Yodkhunpon. Before you begin to think I might have lost my mind, let me clarify. It’s not that Karuhat actually has a super power to read one’s thoughts, so much as as he can see actions one might take as one takes them. Clairvoyance would seem to accurately describe his abilities in the ring, but the reality is that what appears to be mind reading is in actuality a brilliant tactical understanding of the fight game. 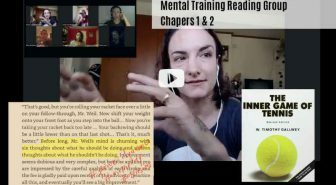 An application that one can see almost immediately in the vlog, that show his “clairvoyant” tactics is his body posture, specifically his head and eyeline positioning. 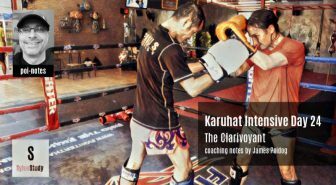 Karuhat almost never raises his head from the often yelled “chin down!” position; and so every punch thrown at him is dodged or slipped, every kick blocked. This position is widely understood to be the best as it provides at once protection for vulnerable areas of the body; but it also can allow a person the advantage of seeing the body begin an attack and so potentially provide a person with an early warning to imminent danger. Most coaches will tell you to focus your vision on the upper torso/shoulder region, avoiding the eyes and seeing the hip in periphery. Interestingly enough, Karuhat’s chin is so low he keeps constant vigilance of her navel and hips, keeping the torso and legs in periphery. Interestingly enough however, many rarely seem to be able to manage this position for long. In watching the full session, you see that Sylvie raises her chin consistently. 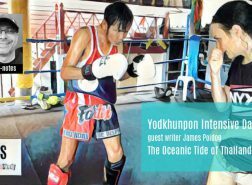 She’s no slouch in the fight game herself, yet as she engages in close, her chin begins to drift up and her eyes begin to seek the face of Karuhat. Later in the session, Karuhat might give a clue as to why. 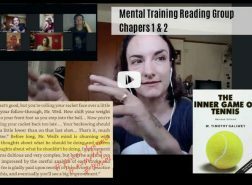 He states through Sylvie that many can’t focus on both upper and lower body at the same time, it creates confusion; and so an opening to take advantage of. Right there is his next act of clairvoyance. He uses our common problems against us by exploiting them. If we struggle to activate multiple areas of the body then he’ll attack one to open another. At 11:45 in the session he shows the high low attacks in both strikes as well as clinch. In both he’s massively successful as is Sylvie herself following his instruction later in the vlog. In understanding how this might pertain to the often understood but rarely utilized chin down position; the root might be in what we do when we are confused. Think of the common response to a loud noise nearby. Imagine sitting at home watching the videos in this library. It is quiet except the talking on your computer. All of a sudden a loud bang from outside. What’s the natural response? To look. the head comes up and we look for the source to the sound that disturbed and confused us. It illustrates that clairvoyance, that tactical understanding of not just any opponent, but all opponents natural inclinations. Consistently, through out the hour he applies this to his techniques. Everything designed to elicit a desired response from the person in front of him. A response he can then take advantage of. And if he doesn’t get it? Well, that’s’ where his other tactical skills come in. At 14:30 in the session we are first introduced to the idea of not being stuck. “You can’t wait for the right thing, the right thing will present itself as you move”. Its easily seen in how Karuhat applies the clinch. He treats the opponent as a washing machine does linens. First one way to achieve the result of opening or throwing, and then the other if the opening doesn’t happen; with the inevitable result that something does open and he is ready to take advantage of it. A final (as far as this write up goes, he has so much more in this intensive to show than I can cover here) thing the clairvoyant does that I wish to tease out for the viewer, is his tactical mind reading doesn’t just apply to his attacks and defenses, but to his understanding of his own body. Alexander Palma, an excellent coach out’ve San Diego, CA instructs his students in what he’s termed zones. A common misconception of these zones is there spacing to an opponent, meaning by example zone 3 is so and so feet from the person you face. That’s not at all what he means. The zones are the ranges that one can use a specific weapon in. Karuhat also employs this tactic with his opponents. The space between my opponent and me is the space I use a kick in, a punch, a knee, an elbow. The space isn’t about safety, it’s about what I can use to finish my my opponent. And here’s where his clairvoyance becomes a study of beautiful tactics. Karuhat has such an understanding of not just his opponents, but of himself that he can not only take advantage, he creates advantage in a fight. He knows that you will raise you chin. He knows if he confuses you with high to low and back again attacks, your guard won’t keep up. He knows that if he keeps pressure both in striking attacks and in clinching, an opportunity will present itself to catch you with a punch to the gut, or a dump to the floor. Karuhat KNOWS. 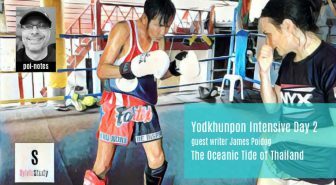 James Poidog is currently a striking coach teaching boxing, kickboxing, and muay Thai to hobbyists as well as amateur and pro level competitors. He started in boxing and karate as a child and moved to kickboxing before finally finding muay Thai as a student. 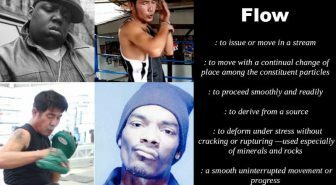 He has also trained in bjj and mma to better understand how striking can be applied in these other realms of fighting. 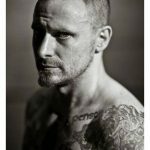 Together with martial arts instruction, he also coaches athletic strength and conditioning, in addition to functional and rehabilitative training. His home gym is Kaiju Mma and Fitness in Tarzana, CA.